Robert Hayles and 19-year-old Mark Cavendish gave Britain their fourth gold at the World Track Championships in California in the men's madison. The pair finished one lap ahead of the field to claim the 200-lap race, ahead of the Dutch and Belgian teams. Cavendish, from the Isle of Man, was only taken to Los Angeles to get some senior experience and the two had not raced together before. 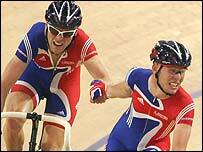 Cavendish said: "I have wanted this for so long and thanks to Rob I've got it." Hayles, who won bronze with Bradley Wiggins in the event at the Athens Olympics, had never won a World Championship title before this week. The 32-year-old looked to have blown his best chance when he failed to make it through qualifying in the individual pursuit. But he was part of the squad which won Saturday's team pursuit and then surprised everyone including himself by winning a second gold. "It was like the Olympics where in the madison we didn't know we would get a medal and so to get a bronze was mad," said Hayles. "And it's the same here because most of the teams had a chance at winning including us and to come and do it is like a split-second thing. "All of a sudden you're a winner, you don't have any time to think about it." Dutch duo Robert Slippens and Danny Stam finished second with Belgium's Matthew Gilmore and Iljo Keisse taking third. Meanwhile, Germany's Rene Wolff beat France's Mickael Bourgain to win the men's individual sprint.